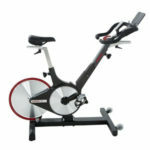 When it comes to indoor cycling bikes, Keiser has always been synonymous with superlative quality. They offer some of the finest trainers that you can find, highly durable and with a unique, sleek design. The Keiser bikes are built in the U.S., under strict quality control standards, this being one of the main reasons that these exercise bikes are quite a bit more expensive than others. But on the other hand, this is also the reason they still benefit from an almost clean 5-star review sheet from users in 2018. The M3i is one of the newest Keiser indoor cycling bikes. It comes with several notable improvements over the older models. It has quite a lot to offer in terms of training possibilities. 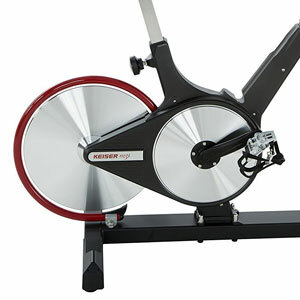 As opposed to many spin bike models, this particular bike features magnetic resistance, a rear drive, and also comes with an advanced exercise meter. 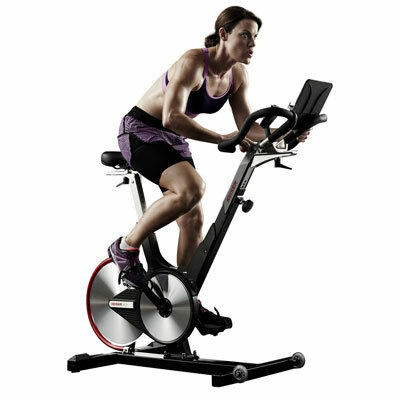 The Keiser M3i indoor cycle features a v-shape frame, which comes with two main advantages. 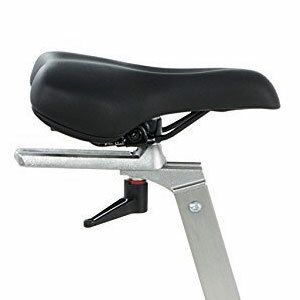 One, it allows the oblique, upright adjustment of both the handlebar and seat posts, and due to this fact, it can accommodate users of all sizes. And two, it has a low center of gravity which considerably improves its stability. Needless to say, the bike’s frame is made of heavy-duty steel tubing. It’s designed to withstand riders up to 300 lbs (136 kg). It’s double coated with a rust-resistant and abrasion-resistant paint, so if stored and used accordingly (indoors only), it should maintain its pristine aspect for a long period of time. With the seat and the handlebars set to their lowest positions, the bike’s length is 48.25″ (123 cm), and its tallest point (given by the handlebar) is 45″ (114 cm). However, the bike’s maximum length (with both seat and handlebars up to their top position) is 60.5″ (154 cm), while its height reaches approx. 50.75 (129 cm) above floor level. Its width is 26″ (66 cm) and remains unchanged regardless how you adjust the bike. Along with these dimensions, Keiser recommends leaving a clearance of at least 24″ (61 cm) all around the bike, for safe operation. Although the Keister M3i features a fairly heavy steel construction, with an assembled weight of ~85 lbs (38.5 kg), its relocation shouldn’t be a problem. 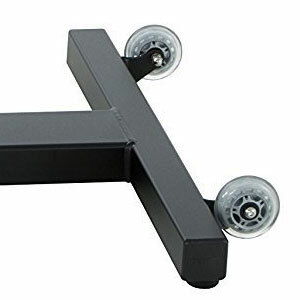 Its front base is equipped with large silicone wheels, and by using these wheels when moving the bike, you will be handling only half of its total weight. The bike’s base is a one-piece H-shaped element. This considerably improves its overall sturdiness. Its front and rear parallel bars are equipped with adjustable stabilizers which have large rubber caps. Therefore, you should be able to level the unit perfectly on any type of surface. In terms of accessories (apart from the console unit), this exercise bike has a bottle holder and a tablet holder. The bottle holder is placed at the bottom of the handlebar tube; it has a concave shape and a flat bottom so it can host your water bottle. The tablet holder is attached to the front part of the handlebar. It’s large enough to support any type of tablet or magazine. It also has an adherent surface so that your device won’t slide off. Like most other indoor cycling bikes designed for spin workouts, the Keiser M3i doesn’t come with an extremely comfortable seat. The saddle included with the bike is fairly slim one, but does have a contoured surface and integrates a layer of padding, so it does deliver optimal comfort. It’s also a standard seat, so replacements for it are widely available. The bike’s seat is 4-way adjustable (up, down, front, back). Both its horizontal slider and its upright post offer plenty adjustment positions. Its bar, slider, and overall construction are made to support users up to 300 lbs (136 kg). The Keiser M3i features a multi-grip handlebar with a unique design. It’s completely urethane dipped, in order to deliver a comfortable and secure grip. Just as the seat, the handlebar is 4-way adjustable. In fact, this exercise bike offers an exceptional micro-adjustability. It can accommodate users between 4’10” and 7’0″ (147 – 213 cm). Both handlebars and seat are easy to adjust. Their adjustment knobs are very easy to grip and turn. Therefore, it takes less than a minute to adapt the bike perfectly to your size. mangets’ housing will rotate enabling the magnets to cover a wider portion of the flywheel, therefore generating a magnetic field of a higher intensity and creating more drag. 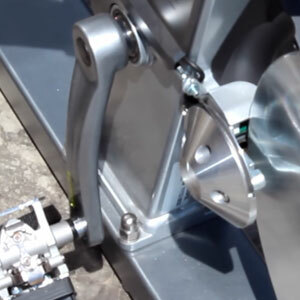 Conversely, by pulling the brake lever towards you, it will enable the magnets’ assembly to rotate in the opposite direction, moving the magnets away from the flywheel and generating less drag. If pushed all the way forward, the lever acts as an emergency brake, automatically stopping the flywheel. The bike’s resistance system offers 24 levels of resistance or 24 gears. However, when changing the resistance you won’t hear or feel a click as in road bikes. Evidently, the 1-3 gears deliver a light workout, while the top 20-24 levels allow you to perform exercising routines of high intensity. The bike’s resistance system is exclusively manual. The unit doesn’t require being connected to a power source. However, the console unit is connected to the brake; it “feels” the selected gear and will display it on its bottom panel. As we’ve mentioned above, the Keiser M3i indoor cycle features a rear drive. In other words, the main element of the drive system (the flywheel) is situated at the back of the bike. There’s quite an important advantage to this feature. Since the flywheel is at the back not at the front, the user’s sweat won’t drop on it, preventing corrosion. As opposed to other indoor cycling bikes, such as the Spinner Edge, or the Efitment IC031, the Keiser M3i doesn’t have an extremely heavy flywheel. The aforementioned bikes have flywheels over 40 lbs, while the Keiser’s flywheel weighs only 8 lbs (3.6 kg). It’s also not perimeter-weighted, and therefore it doesn’t generate a very aggressive inertia. However, since the bike has quite an outstanding resistance system, you can be sure that it delivers very consistent workouts. The flywheel is bi-directional. In other words, you can pedal in reverse, and this way, diversify your exercising routines. The transmission consists of a heavy-duty, stretch-resistant, poly-v belt. A belt drive comes with several advantages. To begin with, it doesn’t require lubrication. It generates almost no vibration during pedaling. It’s almost silent, and overall, it delivers a very smooth pedaling motion. The bike’s crankset is an extremely durable piece. It’s equipped with solid steel arms which can withstand the user in a complete standing up pedaling session. The pedals are also made of a metallic alloy, featuring toe cages on one side, and clips for spin shoes on the other. The Keiser M3i features a slightly wider Q-Factor than other bikes. Its Q-Factor is 197 mm, while for spin bikes such as the Spinner S5, it is only 147mm. Due to this fact, the Keiser bike may not be the best choice for users with bad joints, as the wider Q-Factor may generate extra lateral stress on the knees. But on the other hand, very few users have complained about this aspect. The meter unit included with the Keiser M3i offers quite a few more features than the older version. To begin with, it features a large, multi-panel LCD display, which shows several workout metrics simultaneously. The unit’s display integrates LED backlight and has a sensor for it which detects the ambient light levels, turning it on when needed. The display shows watts, kilocalories, heart rate, time elapsed, distance, total distance (odometer), RPM, and the current resistance gear (or level) of the bike. The unit will swap between Watts/KCal, Trip Distance/Odometer showing each one for 8 seconds on their display section. Distance can be shown in either metric or imperial units; the unit will prompt you to select this preference when you first start pedaling. This exercise bike does not integrate pulse sensors, such as the ActionLine A84016 Pro bike, for example. The meter is telemetric, so in order to read your pulse rate, you must wear a Polar HR chest strap transmitter (which is not included). 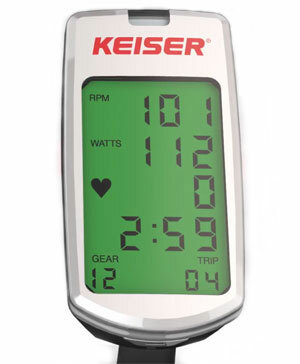 One of the new features of the Keiser meter is its Bluetooth function. This gives you the possibility to sync it with your tablet, laptop, or smartphone in order to directly stream your workout data to various M3i compatible apps, such as the Keiser M Series fitness app, to in order to monitor your progress. Or, you can connect to a 3D immersive cycling experience such as BKOOL. The M3i exercise meter is battery-powered. It uses 2 AA batteries which are included. It doesn’t have any buttons, so setting it up is done by using the shift lever. The manual will thoroughly instruct you on how to do this. It has a sleep mode to which will enter after 60 seconds of inactivity on the bike, and it starts on when you begin pedaling. The main body of the bike, including seat, crank assembly, and handlebar post, comes already assembled in the box. All you have to do is attach this main body of the bike to the one-piece base, then add the flywheel, pedals, console, handlebar assembly, crank and flywheel guards, and several other smaller pieces. It’s not very difficult to assemble, and the manual provides very clear step-by-step instructions for it. The assembly requires your own tools. Since it’s a magnetic resistance exercise bike, there’s basically no wear and tear to the resistance system, so you won’t have to worry about replacing parts there. It’s actually a pretty much maintenance-free trainer. All you have to do is periodically check for loose bolts and parts, and wipe off the sweat from the frame if it’s the case. The flywheel is not perimeter weighted so it doesn’t generate a highly aggressive inertia which some users like. The Keiser M3i is an indoor cycling bike designed for spin workouts. It offers high micro-adjustability, a frictionless magnetic resistance system, and a Bluetooth console, which can track all your workout metrics. It’s an award-winning exercise bike, the result of over a decade of research and development. It’s perfect for light to intense cardio workouts, muscle toning, interval training, stamina development, and weight loss. And finally, even though it’s not exactly one of the most affordable exercise bikes, its overall quality and range of features definitely match the price.